Before we get into the Sennheiser Momentum vs. Beats Studio comparison, grab a snack, sit back and relax because.. There are a few different models of the Momentum that you should know about! Generally speaking, the Momentum 2.0 is the strongest out of the bunch, and fixed some issues that the original had. Fit. The main difference between these two was that even though the original Momentum was marketed as Circumaural, the cups weren’t large enough for most ears. This was the crux of the issue with them, and is the reason why the 2.0’s came into existence. If you have very small ears, the original Momentum may work for you. However, if you have normal to bigger ears, you will need the 2.0’s. Fold-able. The upgraded 2.0’s are fold-able while the originals were not. Rotate. The ear-cups on the upgraded 2.0’s also rotate better for an easier fit. Mid-range. The mid-range was a bit recessed or lacking in the original model, while it’s more forward in the 2.0 version. Some people claim that this makes the 2.0’s have a bit more of a “shout” which is understandable. Price. The original Momentum’s are more affordable than the 2.0’s. Beats Solo HD “drenched in color” 2.0 (2013). Really? No. Both are closed back headphones. Closed back vs. Open back headphones. Both have noise cancelling features. How do noise cancelling headphones work? Both have a mic for taking calls. Both have an iPhone Control. Neither have a lightning connector. Bass. 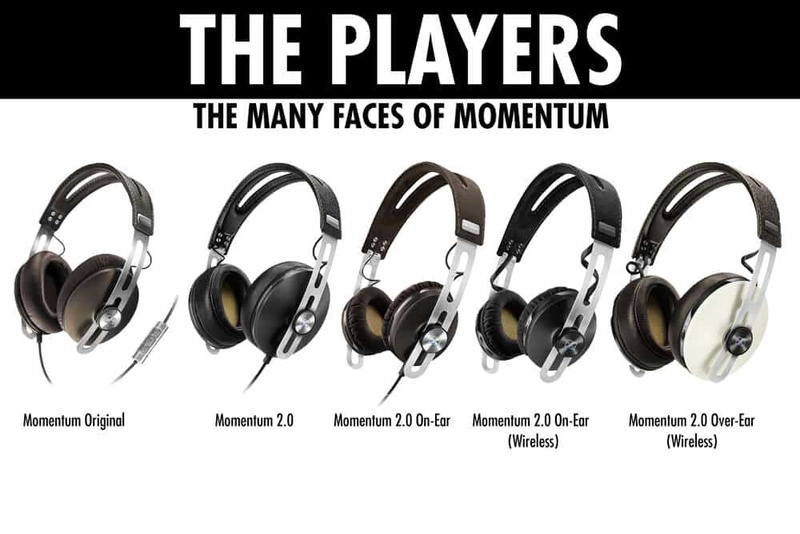 The Momentum’s have a much more refined low end. It’s definitely not for bass heads, but still provides a clear and articulate response that comes across as tight and controlled. The Studio’s bass by contrast has a lot of impact, but is a lot looser by contrast. I don’t consider it “bad” but it doesn’t quite meet my snobby audiophile expectations. This is a bass geared towards the average consumer for sure. Mid-range. The Studio’s mid-range will be recessed due to the overwhelming bass and bright treble. The Momentum 2.0’s mid-range is excellent, and for the most part pretty balanced. After 2k it takes a dip and the treble is warm but perhaps veiled in some peoples minds. What is the Sennheiser Veil? For the most part I do think it’s a myth but there is some truth to it. If you look at a graph of the 2.0 you can see the treble does roll off pretty considerably. This doesn’t take away from their sound however. The treble is there, but it’s warmer than your average headphone. Warm simply means not as bright. They come off as very pleasant sounding in the treble. Treble. Continuing in that vein, the Studio’s treble is your standard bright affair, and can be harsh or sibilant depending on the source and how loud you like your music. What does Sibilant mean? Detail. Because of the better mid-range, the 2.0’s provide detail and clarity in spades that the Studio’s simply lack. The Studio’s are a bass heads headphone, while the Momentum’s aren’t at all. Build quality. The 2.0’s have a better build, although the Studio 2.0’s aren’t that bad. They’re just not as good, and have been known to break down over time. Holding them in my hand I thought they were pretty solid however. The Momentum’s are just better. The Studio’s are mostly plastic, while the Momentum’s sport metal and genuine leather. Ear-cups. Speaking of, the Momentum’s boast genuine leather ear-cups while the 2.0’s have a soft and supple protein leather. I actually did like the feel of the Studio’s cups. Fold. The Momentum’s do not fold up while the Studio’s do. Bluetooth. The Momentum 2.0’s have Bluetooth while the Studio 2.0’s do not. Android control. The Momentum 2.0’s have an Android control while the Studio 2.0’s do not. FR. The frequency response of the 2.0’s is 16Hz – 22kHz. The Studio’s is not specified. Sensitivity. The Sensitivity of the 2.0’s is 113 dB. The Studio’s is not specified. What is Sensitivity in Headphones? Impedance. 28 Ohms for the 2.0, not specified for the Studio’s. What is Headphone Impedance? Weight. The 2.0’s are 9.35 oz. vs. 9.2 oz. for the Studios. Chord length. The 2.0’s have a 58″ in length vs. 54″ for the Studio’s. Warranty: 2 years for 2.0’s, 1 year for Studio’s. So what would I recommend? Of course I’m going to go with the Momentum 2.0’s in this case. They’re better in all regards, and have a more honest and balanced sound signature. That said, what if you’re a bass head? I’ve got a few options for you. For a wireless Bluetooth option, the Solo 3’s are my pick. They are surprisingly good, and the best out of the Beats lot. Interested in learning more? CHECK OUT MY OFFICIAL BEATS SOLO 3 REVIEW!! If you don’t need wireless or Bluetooth, the M50x is the high priest of the casual consumer affair. They’re also a bit more affordable than a Solo 3, and have a somewhat crisper, more audiophile like sound. What if you’re digging a more audiophile type sound? The V-Moda Crossfade M100 is the solution. It’s got a better sound signature than the M50x, and comes across as crisper and more detailed without the harsh 9k peak. Interested? Well that’s about it for today my friend! I hope you’ve enjoyed this article on the Sennheiser Momentum vs. Beats Studio comparison. Sennheiser HD1 vs. Momentum | SAME THING? ATH AD900x vs. M50x | STARK CONTRAST! Oppo PM3 vs. HIFIMAN HE400i | ARE THERE BIG DIFFERENCES?